Most children LOVE weather, and will love reading and learning about it, too! 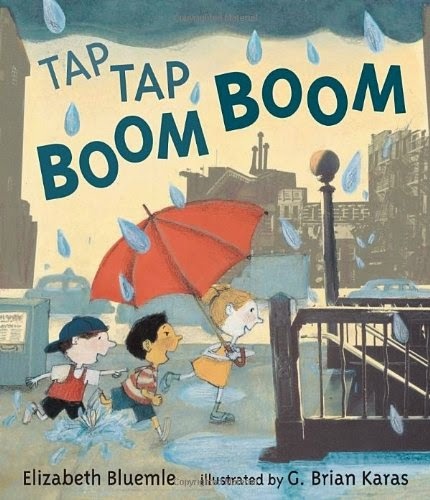 These Books About Weather, which we read as part of our Weather Theme Weekly Home Preschool, are a great place to get you started. I've divided the list in to categories to help you find what you need. 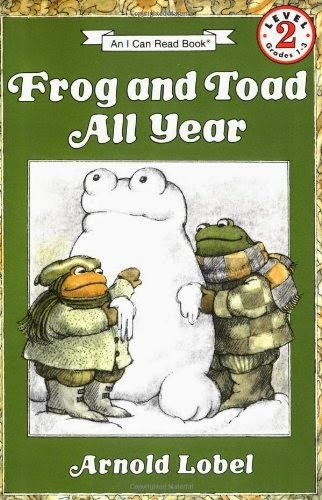 Frog and Toad are the best of friends, and this book takes them through all the seasons and the accompanying different weather. They go sledding in the snow, wait for spring to arrive, enjoy ice cream in the hot weather, and rake one another's leaves. The "Frog and Toad" books are classics that your children will love. They also make great easy readers once your little one starts to read. 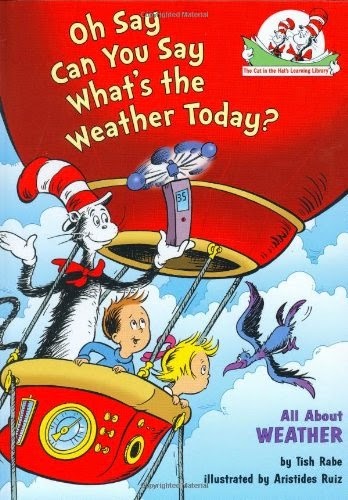 This book from the "Cat in the Hat's Learning Library" series is a great comprehensive non-fiction overview of all types of weather. It uses characters that your children are familiar with, a clever rhyming cadence and lots of great pictures. Your toddlers may not quite understand it all, but the rhymes and colorful illustrations should keep them listening. Your preschooler or elementary aged child will learn a ton about weather! 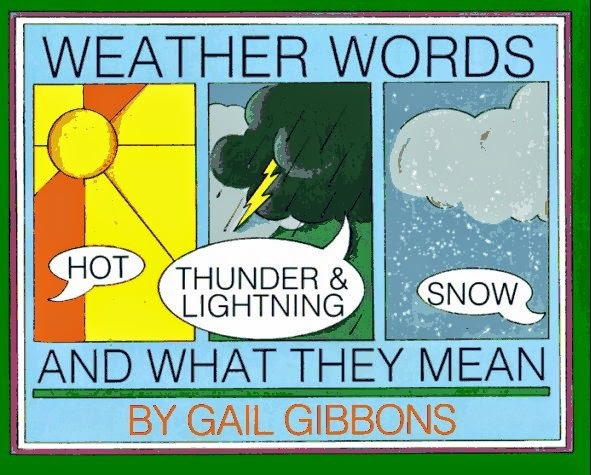 Gail Gibbons is your go-to author for non-fiction children's texts. I love the simple, vintage-style illustrations that are clear and informative. Weather Words and What They Mean is not cutesy, like the Cat in the Hat book, but it is very straightforward. It would be a great choice to help an elementary aged child review a school unit on weather or provide an introduction to older preschoolers. Your toddlers and young preschoolers may not be interested. Okay, so this book isn't really about sunshine. 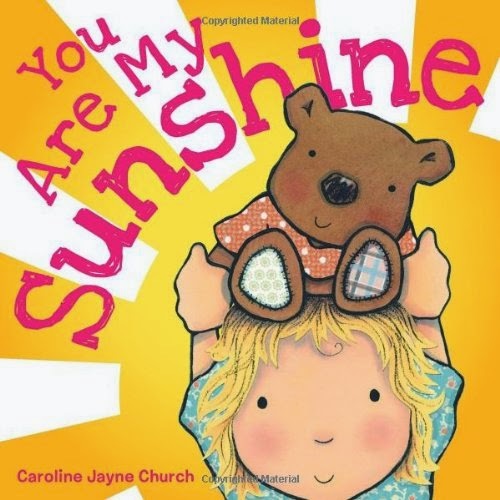 But it does have the simple words to the song, "You Are My Sunshine" along with adorable illustrations by Caroline Jayne Church. This little board book has been a favorite in our house for several years. It is a great choice for babies and young toddlers-- you can turn the pages as you sing the song, which is a great way to help your children get that warm and cozy feeling about books. 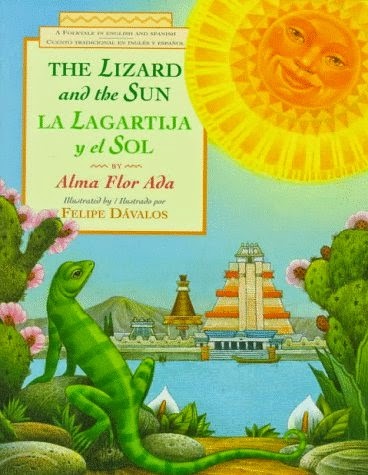 This traditional folktale about the sun is presented in both English and Spanish! In the story, the sun disappears and it is the persistent lizard who eventually finds him and helps to convince him to return. Since that time, lizards have liked to bask in the sun as they remember how one of their own helped solve such a terrible crisis. This is a fairly long story with long paragraphs of text on each page, so I recommend it for older preschoolers and elementary aged children. The illustrations are lush and detailed, and present a beautiful picture of a very different time and culture. I really enjoyed having several different folk tales about the sun to read this week. We used it as an opportunity to talk about how folk tales have developed as a way for people to explain things that they didn't understand or that were important to them! 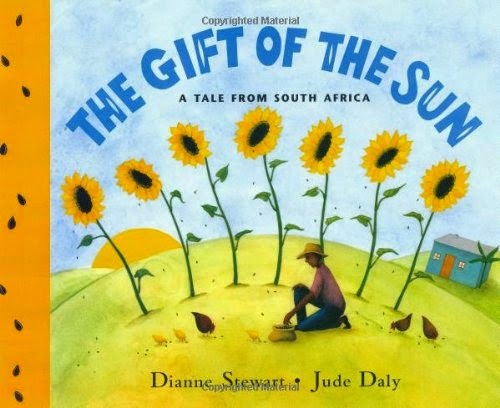 In this story, a lazy farmer (who likes to bask in the sun) eventually loses everything except for one bag of sunflower seeds. Through the power of the sun, he eventually is able to return his family to prosperity. It is a great sort of circular tale! The sun has disappeared in this imaginary, animal-filled town. A clever puppy dog baker makes a giant sun bread that cheers up the residents and wakes up the real sun! The illustrations in Sun Bread are full of tiny details that you and your children can pour over. They are bright and full of life! 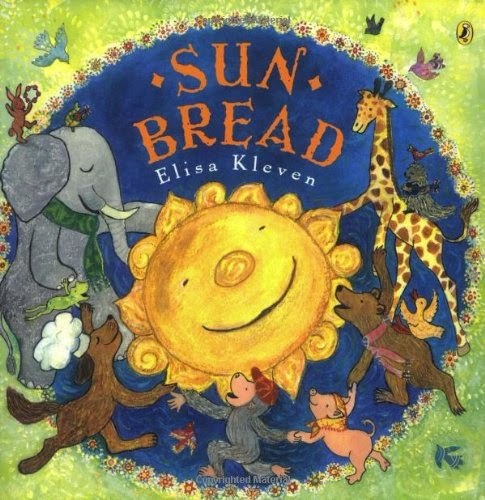 There is even a recipe on the back cover for Sun Bread that would be a great project for your kids! This book deserves a place on your shelf, if for no other reason than the striking illustrations. They're geometric, abstract, and done with bright colors on a stark black background. We have read this story over and over this week, and each time we are able to notice more and more about the illustrations. The story is a retelling of a Pueblo Indian tale, which, mirrors the Christ story in many ways. The original story, Cloudy With a Chance of Meatballs is not much like the movie, if you're seen it. The premise is the same, but the book is (as usual) better! Grandpa tells a bedtime story about the town of Chewandswallow where all the townspeople's food falls from the sky. 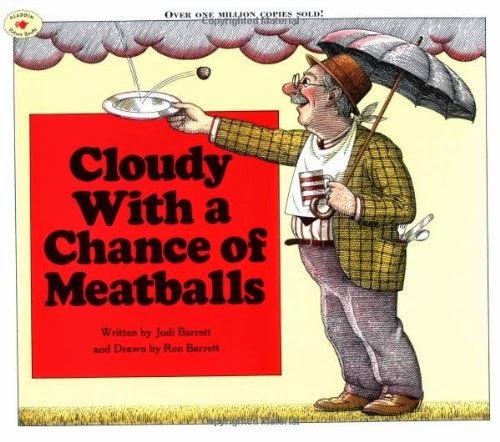 This book isn't about weather, but it's a classic! The pen and ink drawings are done in a comic book style, and are so funny! Kid of any age will find this book hilarious! The year that Lena was 2-years-old, the only thing she wanted for Christmas was an umbrella. 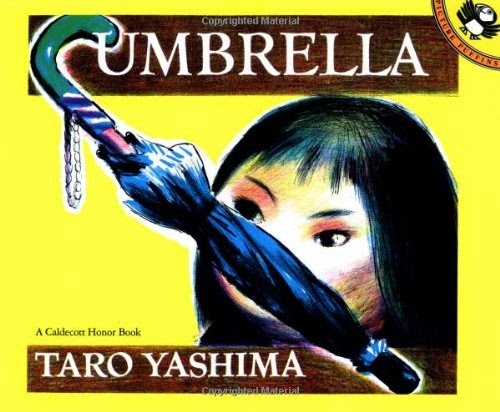 When I saw this story, about a little girl who is SO excited to receive an umbrella as a gift, I knew she would love it. Little Momo gets her umbrella and waits patiently for a rainy day when she can use it. Finally, it rains and she is able to carry her umbrella through the city. This is a sweet, calm story, best suited for preschoolers or elementary aged children. This is the first non-fiction book by Tomie DePaola that I've seen! 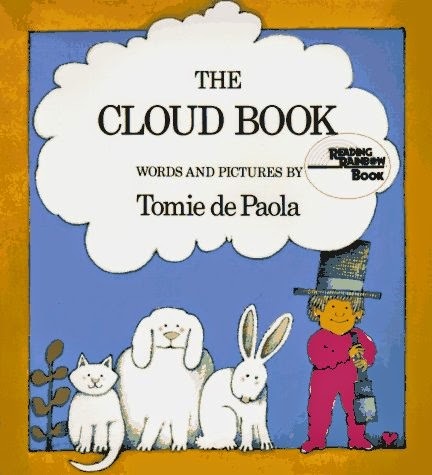 De Paola explains all about clouds-- why and how they form, the different types, and a few classic idioms about clouds. I'm not sure how helpful it would actually be in helping children learn to identify cloud types, since the illustrations are done in the author's traditional clunky cartoon style. Actual photographs or more realistic illustrations might be more helpful. Nonetheless, my girls enjoyed this book because they've come to know and love Tomie DePaola's style. I recommend it for toddlers and preschoolers. 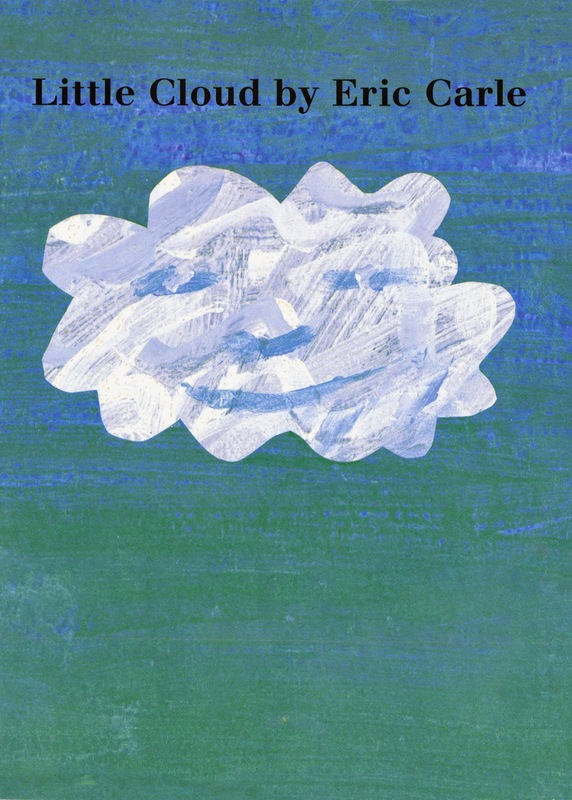 This Eric Carle classic is about a little cloud that changes into many different shapes. There is not much to the story, but my girls love it anyway, and it always sparks a little bit of cloud daydreaming of their own! This book is also a great jumping off point for some fun art projects done in an Eric Carle style. I recommend Little Cloud for babies, toddlers, and preschoolers. 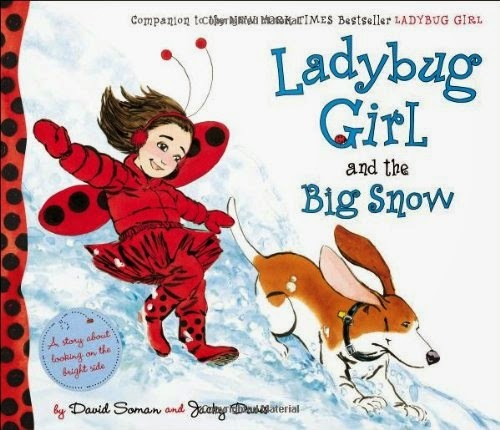 We absolutely love the Ladybug Girl series. Lulu is such a great role model for young girls, and each of her stories teaches a nice lesson in a gentle, non-overbearing way. In this story, Lulu and Bingo play in the snow together and learn that even if things don't go as planned, they can still have a good time! Older toddlers, preschoolers, and elementary aged children will love this story. 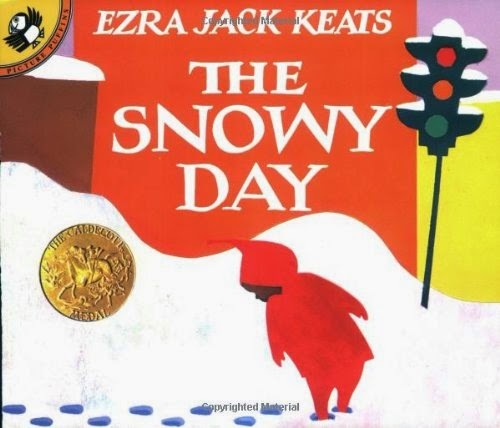 If you don't own The Snowy Day, then you should go out and purchase it immediately. 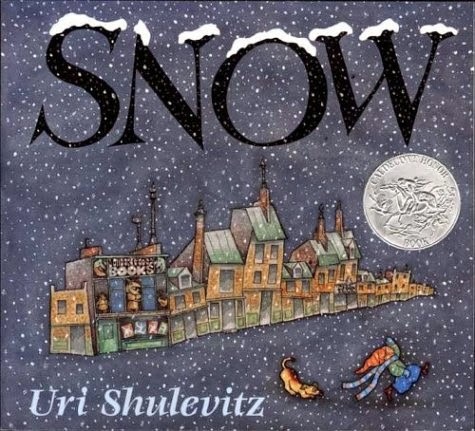 The story of a little boy, who lives in the city, going out to explore and play on a snowy day, is one of our all time favorites. 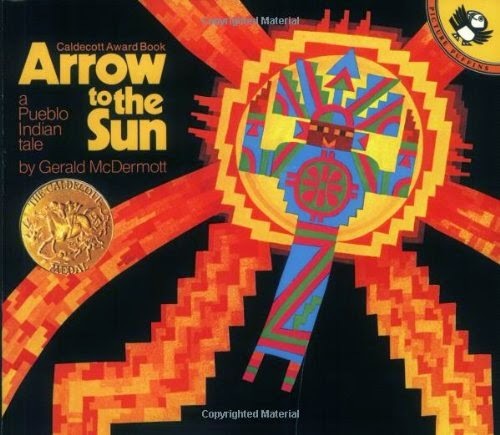 There's a reason you see that Caldecott Medal on its cover! Keats' illustrative style is so simple and captivating, and the colors he uses in this book are delightfully retro. 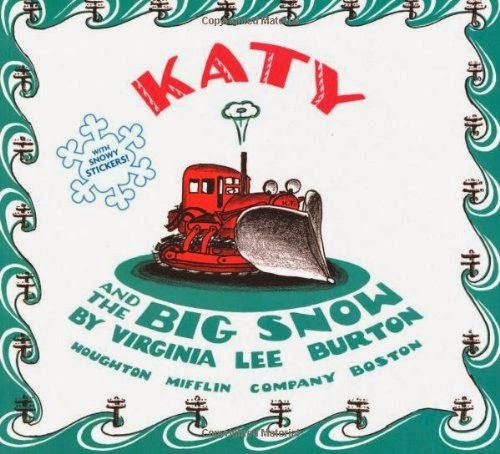 Katy and the Big Snow is one of our very favorites! Katy is a snow plow, but she is so powerful that she only gets to go out in the BIG snows. Sure enough, one comes and Katy gets to work rescuing the city. The illustrations are detailed, and show Katy chugging through a map of the city. My girls love to trace their fingers along Katy's circuitous path! They also love to pretend to be Katy, and push around a laundry hamper through the 'snow' in our house. I cannot recommend this book enough! What a beautiful book! This book has won all kinds of awards, and they are well-deserved. A little boy is convinced that it is going to snow, but the adults in town think that it is just a few flakes, or that it will all blow away and amount to nothing. But soon the whole city is blanketed in snow and the boy goes out to enjoy frolicking with his pup and neighbors. The illustrations immediately reminded me of old school Russia, and the author's style has no doubt been influenced by his Polish heritage. This is a cute book for toddlers and preschoolers (and it will make adults smile, too). 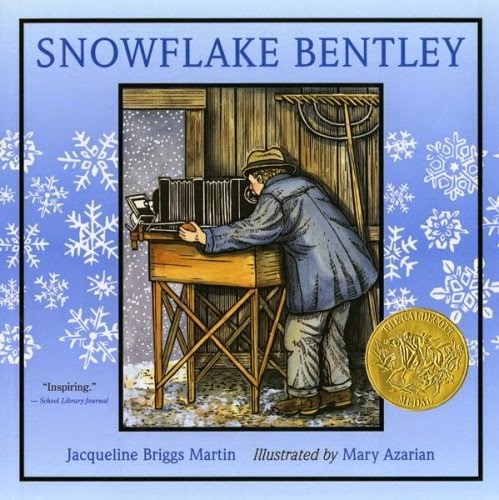 Snowflake Bentley tells the story of real-life Wilson Bentley, who was obsessed with snowflakes from a young age. He eventually developed a method of photographing them, and became quite famous for it! The wood-cut style illustrations are stunning. I love the message in this story of sticking with what you love! First the wind take an umbrella, then a hat, then a balloon, and so on. Eventually the wind is carrying a whole stream of objects and they are being followed by their owners. This is a cute little book, and the illustrations are great! I recommend this book for older babies, toddlers, and preschoolers. A major wind storm has struck Mother Goose land! 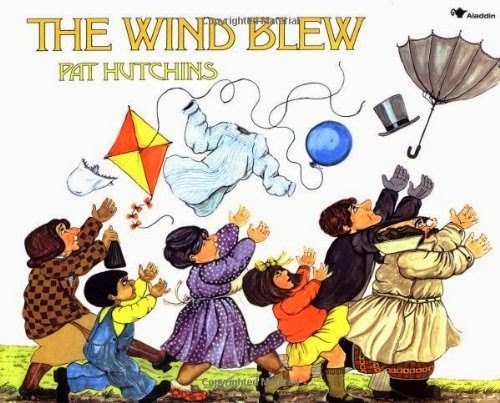 After the wind blows the baby in the cradle out of the tree and onto an old lady's shoe house, this cause and effect tale begins! The gusty wind keeps these Mother Goose characters busy, with objects from one rhyme blowing into another rhyme's scene! Everything gets topsy-turvy as the characters try to chase down their belongings and set things right. This rhyming story is super cute, and the illustrations are bright and crisp. 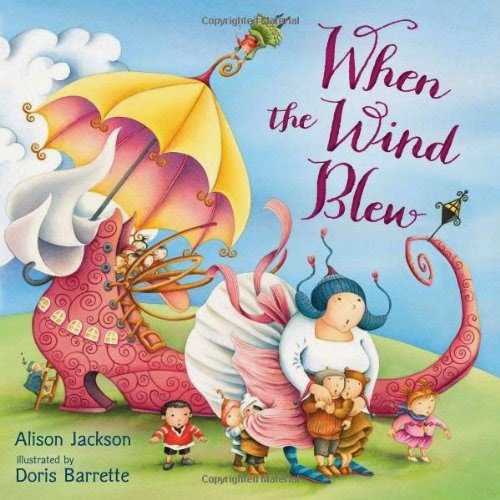 When the Wind Blew is a great story for any Mother Goose lovers out there, especially toddlers and preschoolers. If your child is easily scared, you may want to skip this story. 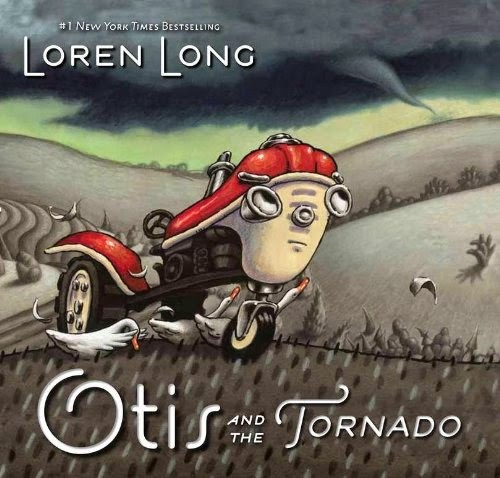 A tornado is heading towards the farm where Otis and his friends live. The poor bull is stuck in his pen and Otis rescues him at the last minute, even though the bull has never been nice to him. Everything turns out fine in the end, but there are definitely some scary pages! We happen to live in an area where tornadoes are not a problem, so we could legitimately tell our girls that this was something they didn't need to worry about. All that being said, Otis is one of our favorite characters because of his bravery, kindness, and compassion-- all traits that we want our children to have. A storm is heading to the city! The words are simple in this story, but the pictures are fantastic! They depict a rainy, stormy city scene-- something that many children may not get to see in their everyday lives. Children scamper down to the subway to escape the storm, and they listen to the sounds of the thunder and rain above. My toddler, especially, liked this book, and she even sang herself a little "Tap Tap Boom Boom" song as she fell asleep the night we after we read it! 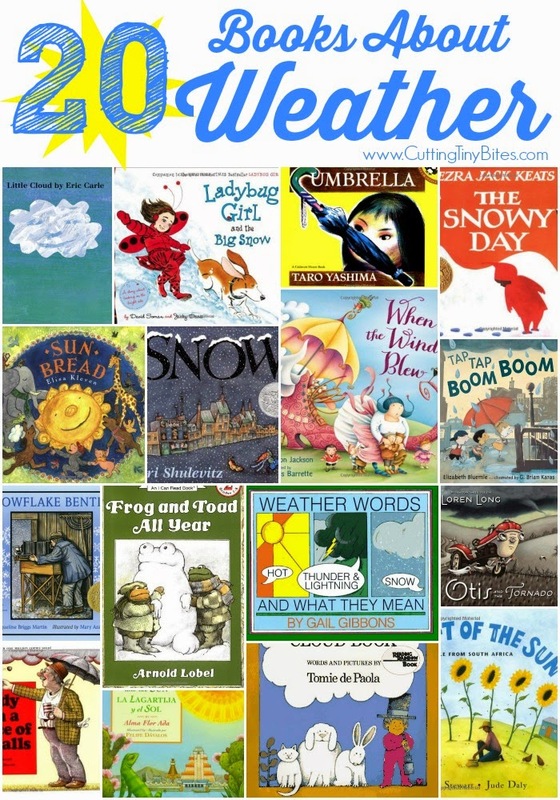 Books About Weather- Book review list with choices for toddlers, preschoolers, kindergartners, and elementary kids. Rain, snow, wind, sun, and storms!